The Pittsburgh Penguins and CONSOL Energy Center will be hosting the 2012 NHL Draft on June 22nd and 23rd. In the days leading up to the draft, PittsburghPenguins.com will be highlighting some past draft selections throughout Penguins' history. With the No. 1-overall pick in the 2003 NHL Draft, the Pittsburgh Penguins selected Cape Breton goaltender Marc-Andre Fleury, making him the third goaltender ever selected No. 1 overall in the draft and the Penguins’ second No. 1-overall pick in franchise history (Mario Lemieux – 1984). Fleury was thrown into the fire instantly as an 18-year-old rookie. In his first career NHL start Oct. 10, 2003, “Flower” stopped 46 of 48 shots, including a penalty shot. 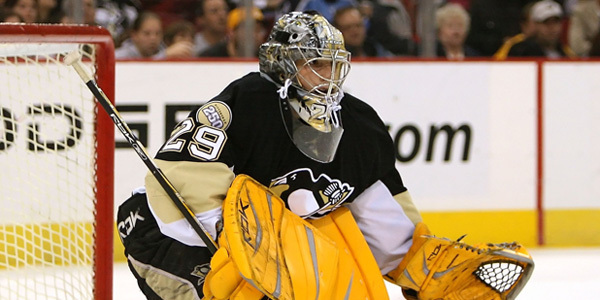 Fleury’s breakout season came in 2007, helping lead the Pens to their first playoff appearance since 2001. Fleury played in a career-high (tied) 67 games, compiling a 40-16-9 record with a 2.83 goals-against average, .906 save percentage and posted a career-high five shutouts. After an injury-riddled 2008 season, Fleury led the Penguins back to the Stanley Cup Final for the first time since 1992. The netminder from Quebec entered the NHL’s elite class of goaltenders after a stellar 2009 season. Fleury posted a 35-18-7 record with a 2.67 goals-against average and .912 save percentage to go along with four shutouts. Fleury continued his strong play going into the Stanley Cup playoffs to set up a rematch of the previous years Stanley Cup matchup between the Detroit Red Wings. Fleury was a key contributor for the Pens as they dethroned the Red Wings to win the cities first Stanley Cup since 1992. Fleury experienced a career-year for the Pens during the team’s injury-plagued 2010-11 season. Voted Team MVP that year, the netminder set new career bests for goals-against average (2.32) and save percentage (.918), leading a team back to the playoffs without three of its superstars for much of the season due to injury (Crosby, Malkin and Staal). Fleury was also selected to participate in his first All-Star Game. This past season was a milestone year for Flower, as he posted a career high in wins (42) while also posting a 2.36 goals-against average and a .913 save percentage. Fleury also tied former netminder Tom Barraso for most wins (226) and shutouts (22) in franchise history. In 434 career games with Pittsburgh, the netminder has a record of 226-143-41.